Ease of installation AXIS T93F series is out-of-the-box ready for installation outdoors. Extra room for more AXIS T93F offers an empty space behind the camera, useful if a larger lens is needed for the camera or to place other devices. 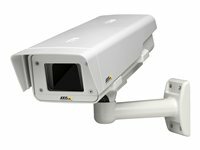 AXIS T93G05 Protective Housing is designed to perfectly match AXIS M1124 and AXIS M1125 Network Cameras. AXIS T93G05 features IP66 protection rating against the ingress of dust and high pressure water jets from any direction as well asIK10 impact protection. The housing is prepared for Power over Ethernet connection and comes with AXIS T94Q01A Wall Mount with an internal cable channel for tamper protection. There are various brackets and accessories available for AXIS T93G05 Protective Housing, such as ceiling mounts, pole mounts, column mounts and conduit back box.